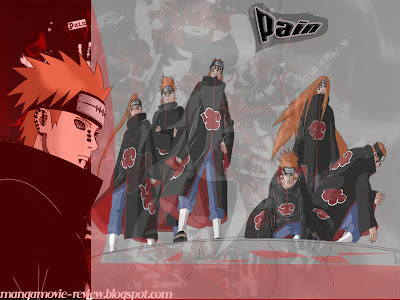 Pain is shown to have at least six physical bodies, which he refers to as "The Six Paths of Pain" (Pein Rikud), stating that the name "Pain" is shared by all six. The bodies he is not currently using are kept in a type of machine, though it is unknown if the machine itself plays any role in the process. Of the six bodies he has been seen in, the only common characteristics are the same orange hair color, a number of piercings that differ between bodies, and the Rinnegan. Each body has its own unique abilities, allowing Pein to use different bodies to deal with a variety of situations. The body with a large ponytail (pictured on the far left) is able to summon a wide array of creatures as well as Pein's other bodies. The fat body (far right) is able to absorb ninjutsu as a form of defense. A long-haired, thin body (fifth from the left) is adept at taijutsu. The Rinnegan allows them to share visual information seamlessly, giving him the ability to coordinate offense and defense with these bodies as if they were a single entity. From the meaning of the name itself, the Rinnegan could be a doujutsu that can reincarnate together with the soul that possesses it. Pain could be the reincarnated Rikudou Sennin in other words. There are some clues that seem to point toward this. First is the Sennin's name, Rikudou. Many fans on Chinese boards who know the Rikudou concept quite well have speculated that Rikudou Sennin may have transcended the six realms, meaning he is immortal unless he wishes to discard his current body and go through the reincarnation process again (he wishes to "die" in other word) and he could have the ability to choose which realm he wants to reincarnate into. Another clue is the necklace. Both Rikudou Sennin and Pain wear the same necklace with 6 magatama. Nagato didn't have it when he was a child. If the Rinnegan wasn't a bloodline limit the necklace couldn't be a family heirloom. Pain must have gotten it somewhere. There are two possibilities I can think of. Pain could've learnt about the legend behind his Rinnegan some time later in his life and since then decided to wear the same necklace as that of the legendary shinobi ancestor who had the same eyes as his. The second possible explanation is that Pain is the reincarnated Rikudou Sennin. Same soul same terrible taste of fashion. Remember the blank Nagato said he had when he killed that Rock chuunin? It could be a sign of the Rikudou's memory/instinct temporarily being woken up. But later in his life Nagato had fully regained the memory of his previous lives and remembered who he was and what his goal was, thus changing into another person (turn evil from Jiraiya's perspective). 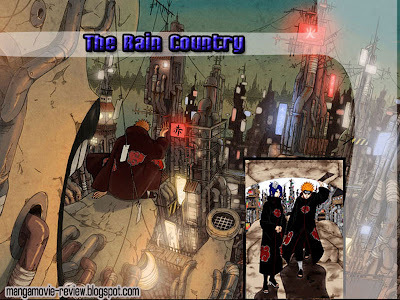 Rain Country "Home of Pain"
all six on the picture actually death already.with some kind of transmission,the real pain aka nagato transmit his chakra to this six corpses to control it.real nagato died when he himself realize that the world still have hope.